Green shaded areas indicate flood warnings still in effect until early Friday morning. A wind advisory and flood warnings continue through the overnight hours. National Weather Service officials say rain from earlier today will freeze overnight causing slick roads. Friday morning wind chills could drop to -5 degrees. 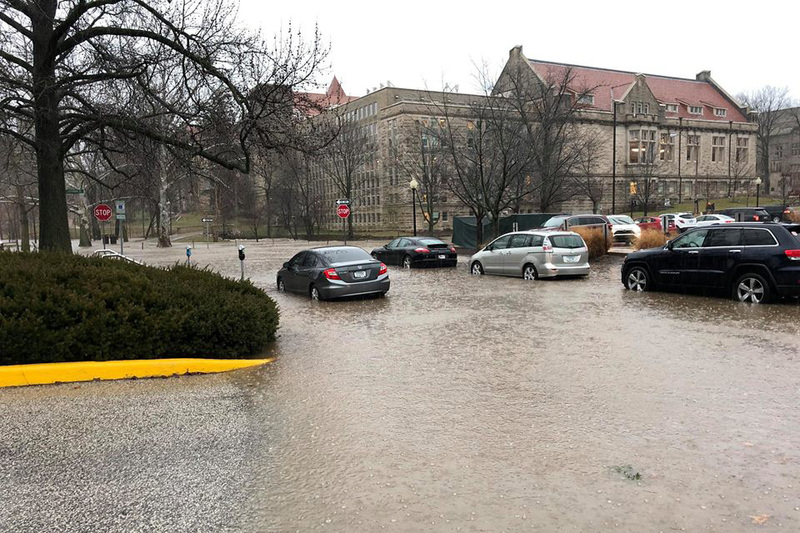 Thursday's rain total in Bloomington measured 5.7 inches. Columbus saw 4 inches. At Spencer, the White River is expected to crest at nearly 7 feet above flood stage. Weather status by county as well as delays and closings being reported to WFIU and WTIU News can be found here. Emergency officials in Knox Co. are reporting tornado damage at 4222 Band Mill Road five miles from Decker, IN. The National Weather Service issued several tornado warnings earlier today for radar-based rotation. 60 MPH winds were predicted with severe thunderstorm warnings. Fire rescue officials in Edinburgh say 5.13 inches of rain fell over the past two days. The storms Thursday also prompted several tornado warnings, but none were immediately confirmed. 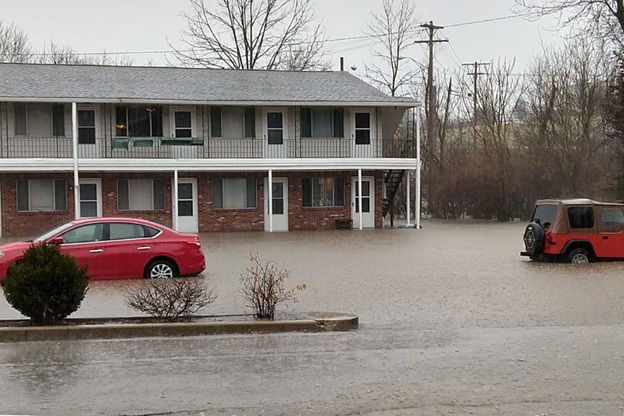 The National Weather Service reported more than 3 inches of rain fell near Vincennes in 4½ hours and heavy rains left downtown streets impassable in the Monroe County town of Ellettsville. Part of Indiana 46 was under water. 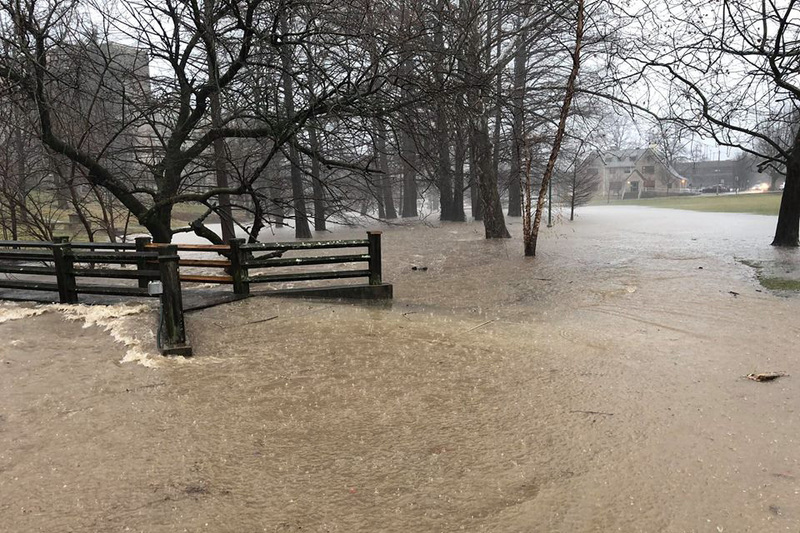 Several schools in the Bloomington area dismissed early because of flooding. The weather service warned "significant" flooding is possible on the Wabash River at Lafayette and Gibson County and on the White River from Spencer downstream. At Spencer, the White River is expected to crest at nearly 7 feet (2.1 meters) above flood stage. Law enforcement is reporting downtown streets in Ellettsville are impassable. State Road 46 westbound is under water. State Road 46 west of Nashville is also flooded. Cave Road at Gifford Rd. Maple Grove at Bottom Rd. Mt. Tabor Rd. at Bottom Rd. 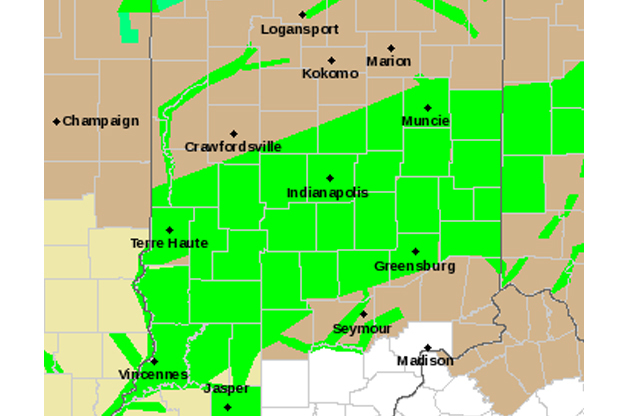 A flash flood warning is in effect until 3:30 p.m. for much of south-central Indiana. The National Weather Service issued the warning Thursday for northern Monroe County, Morgan County, northern Brown County, Owen County, southeastern Vigo County, and more. A flood warning will remain in effect until 7:30 p.m., and a flood watch will remain active until at least 1 a.m. Friday. Due to the flooding of many of our roads today, high schools and middle schools will be releasing at 1:50 and elementary schools will be releasing 2:50. We apologize for the inconvenience however our students and staff safety is our top priority. "Our transportation department is doing a wonderful job of making sure the kids are getting where they need to be," says spokesperson Andrew Clampitt. "That's why we send out those announcements as early as possible."